Lifeline® normal Human Gingival Fibroblasts provide an ideal cell system to establish serum free human feeder layers for human embryonic stem cell cultures or as a model to study wound healing, toxicology or basic cell biology. These fibroblasts are isolated from human gingival tissue. Fibroblast cells have been isolated, plated and expanded in culture vessels twice before being harvested for cryopreservation to ensure the highest purity, viability and plating efficiency. 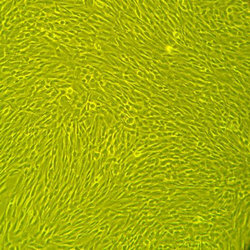 Our fibroblasts are quality tested in FibroLife® S2 or FibroLife® Xeno-Free Medium to ensure proper growth and morphology over a period of at least 15 population doublings. Gingival Fibroblasts can be grown in Xeno-free conditions when cultured in FibroLife® Xeno-Free Medium. Lifeline® fibroblasts are not exposed to antimicrobials or phenol red when cultured in the respective Lifeline® medium, which is an advantage since these supplements can cause cell stress and “masking effects” that may negatively impact experimental results.